The 1910 Alexander III Equestrian Egg is made of rock crystal, platinum, portrait diamonds and rose-cut diamonds. 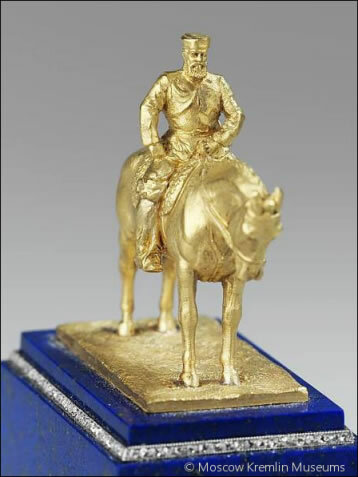 The miniature statue is made of green gold, lapis lazuli and rose-cut diamonds. The Egg, containing a gold replica of the monument to Alexander III by Peter Trubetskoy (1866-1938), rests on a rectangular base of lapis lazuli bordered by two rows of roses. 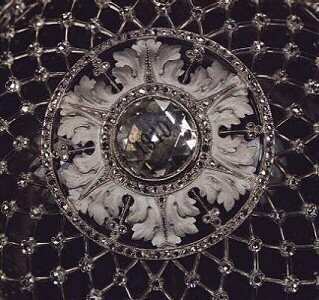 The Egg is carved out of rock crystal and is covered with a platinum lace work strewn with roses. A large diamond surmounts the Egg and is engraved with the year "1910". The diamond is set in band of small roses, with a rosette border of platinum acanthus leaves. The two platinum double-headed eagles on the sides of the Egg have diamond crowns. The surface of the Egg between the eagles is engraved with branching patterns which are adjoined at the bottom. 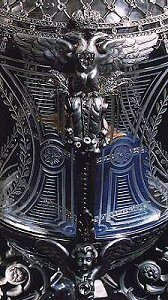 The lower hemisphere of the Egg served as a platform for the replica of the monument and is supported by cast platinum cherubs coiled into position on a base of crystal. The Alexander III Egg is considered by many as one of the most beautiful Fabergé Eggs. The Egg was the fourth Egg made for the Dowager Empress to commemorate her late husband. The other three are the 1896 Alexander III 12 monogram Egg, the 1902 Empire Nephrite Egg and the 1909 Alexander III Commemorative Egg, the latter two missing or lost. 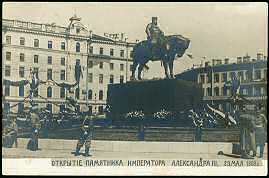 The enormous statue of Alexander III, ordered by the Dowager Empress Maria Feodorovna, on which the miniature is based, was made by Trubetskoy and unveiled in 1909. 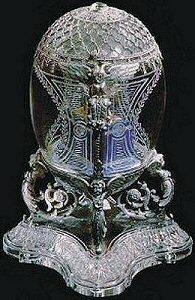 The abundant use of platinum in this Egg may be misleading; platinum was in Russia at that time not regarded with the esteem reserved for gold. The Egg has no official state mark because platinum had no hallmark in Russia at that time. 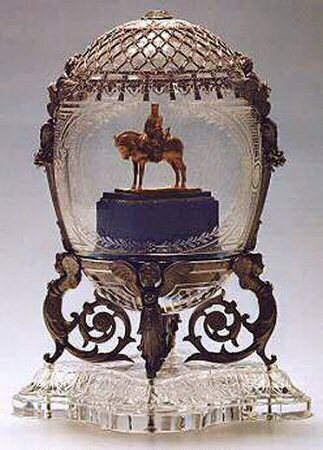 The Alexander III Equestrian Egg was never sold and is retained since 1927 in what is nowadays the Moscow Kremlin Armoury Museum. Update May 2017. Here is a very beautiful photo of the surprise of this Egg; the Trubetskoy Alexander III statue as Fabergé made it for the 1910 Imperial Egg. The horse and horsman are made of gold and the rectangular base of lapis lazuli is bordered by two rows of roses. (Roses here are rose-cut diamonds). Courtesy Romanov News and Moscow Kremlin Museum.